I miss Bob Ross and could watch his show all day. Since he has over 2 million subscribers on Youtube, I’m thinking I’m not alone. 🙂 His lessons are timeless. It’s so soothing, happy and mesmerizing. How he dreamt up a beautiful landscape and made it come to life all in a 30 minute show. It’s admirable. I’m comfortable with DIY projects, stenciling and decorating my home. But oil on canvas seems so intimidating. 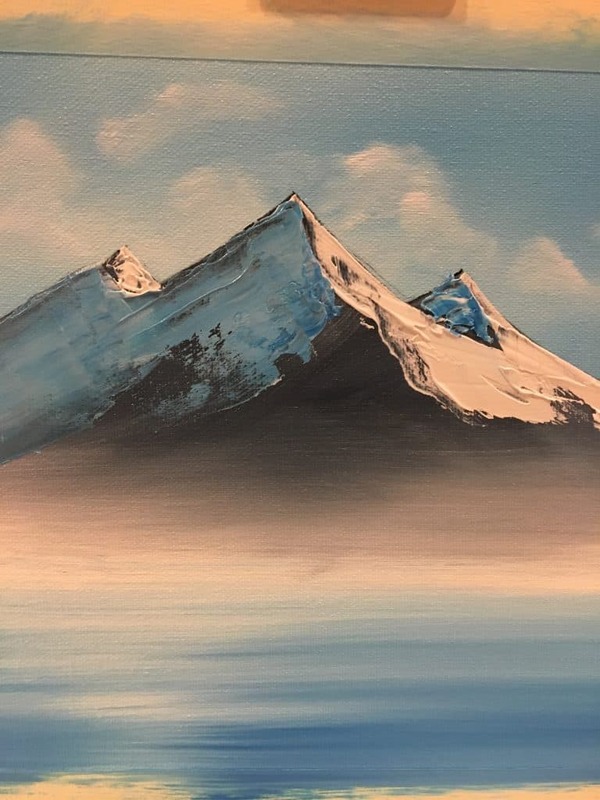 So when I saw a Bob Ross Certified paint class in my area…I immediately signed up my 14 year old daughter and off we went for a fun night together. Here is what I learned about Bob’s process…and myself. Or you could interpret this as: “I set low expectations for myself”. This is because I remember my lifelong attempts at painting an oil-on-canvas — they weren’t pretty. I fully expected my painting to look like something I produced as a 3 year old in preschool. What happened instead? We listened carefully to our instructor, and the end result surprised us! Without a doubt, the technical explanations from Nick, from Your World on Canvas helped us tremendously. Every single step, the instructor would show us exactly what to do. From how to hold the brush, how to approach the canvas, position and the movement. He’d explain the application and how much pressure to put on the canvas. For someone like me this really helped my confidence. 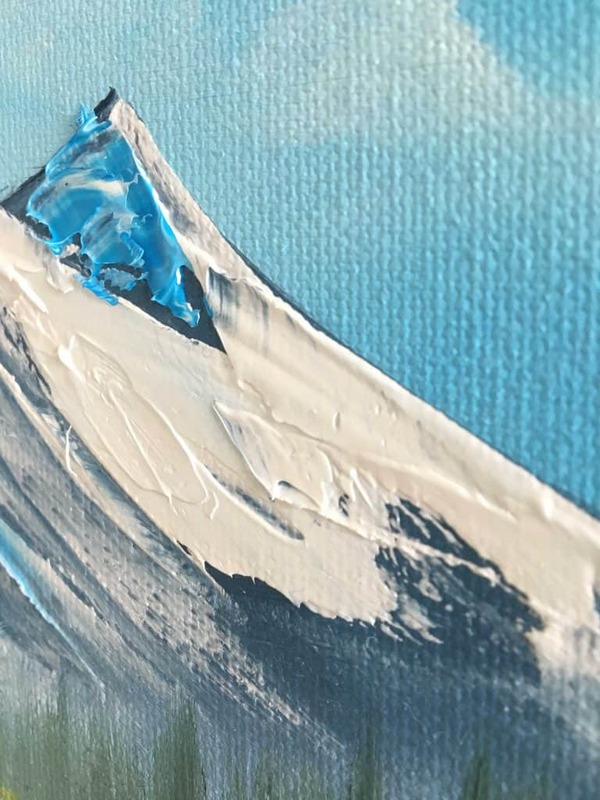 Once we all painted our mountains, we were all getting really pumped for the next step. We shocked ourselves after this step…it’s way easier than you think! Knowing how to load your brushes was so helpful. There is even more nuance to this than I realized. Having an instructor in a live setting allowed me to triple check our brushes to for too much or too little paint. All things I probably wouldn’t have known to correct on my own during the first lesson. I wasn’t sure yet…but my painting looked good from a distance. If you’re an over-thinker or a perfectionist…this class is great for you. Great things can happen on the canvas once you trust your instructor and your technique. At first you may not recognize the great work you’re doing. But once you take a step back, you’ll appreciate your masterpiece. Doing the background then knowing what comes next isn’t easy as a beginner. Seeing exactly how the landscape comes together and in what order was so helpful. And now watching Bob’s episodes will be a great guide for me if I want to try this at home. This gave me so much confidence to think that I was only 15 more fun sessions away from potentially becoming a pro. Each person approaches the canvas slightly differently. So I enjoyed seeing the different outcomes from each person. 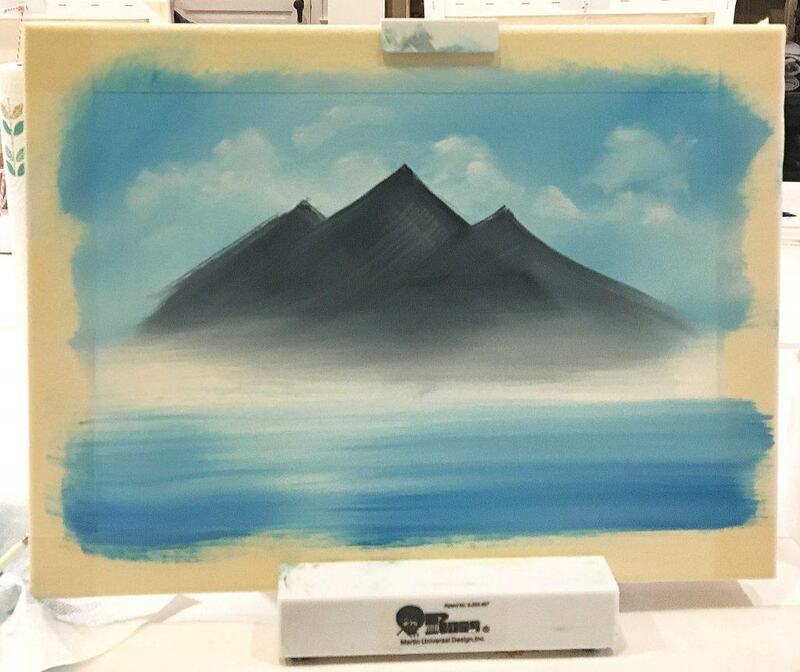 At the beginning of class I was hoping to copy the instructor’s painting and technique. But the beauty here is developing your own style. I’m no Bob Ross, but we are both amazed at the outcome. Here is Avery’s painting (she’ll be 15 in March). Hers looks like a photograph! Mine looks more like a painting up close…but I was marveling at Avery’s work! We both had such a good time we’re now signed up for our second class next month. 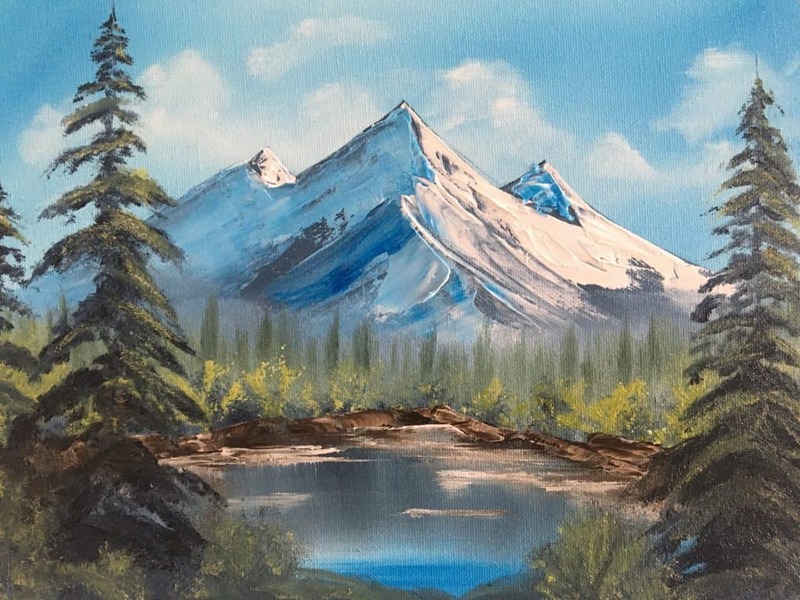 I think I can watch and paint along with a Bob Ross show now with more confidence. Getting the feel for the brushtrokes and the techniques are just the first steps. Now I hope one day I can sit down at a blank canvas, and capture the images in my mind, the same way Bob does. The lesson I learned? You can pretty much do anything you set your mind to, even if it feels alien at first. You can update your home. Learn to decorate. You can gain confidence when learning how to use power tools…and you can even become an artist if you want to! 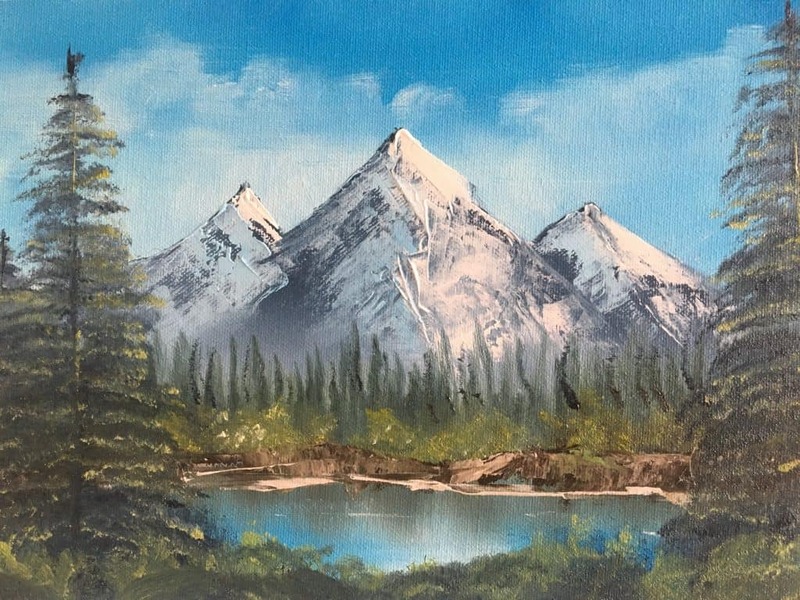 If you have a class in your area and you love Bob Ross, I highly recommend it! You might surprise yourself! Wow, Jeanette, truly impressed with both your and your daughter’s paintings! Looks like artistic talent runs in the family! Thanks Susan. The credit goes to our instructor. He made it as easy as a paint by number painting. Anyone can do this…really! My son is an artist, and over the years I have learned to appreciate everything that goes into the piece of art, no matter what it is. He has long appreciated Bob Ross. I think both yours and your daughter’s piece came out beautiful. It seems that you truly enjoyed the experience. Love Bob Ross! His voice was so methodically relaxing and his work was amazing. I am impressed with both your daughter’s painting and yours! What a fun way to spend the evening for the two of you! I’ve seen these classes, but was always intimidated to try. Great idea for a parent-child or spouse outing. Thanks for sharing! Thanks for sharing your experiences. I haven’t painted since art class in high school but I’m inspired to pick my brush back up! 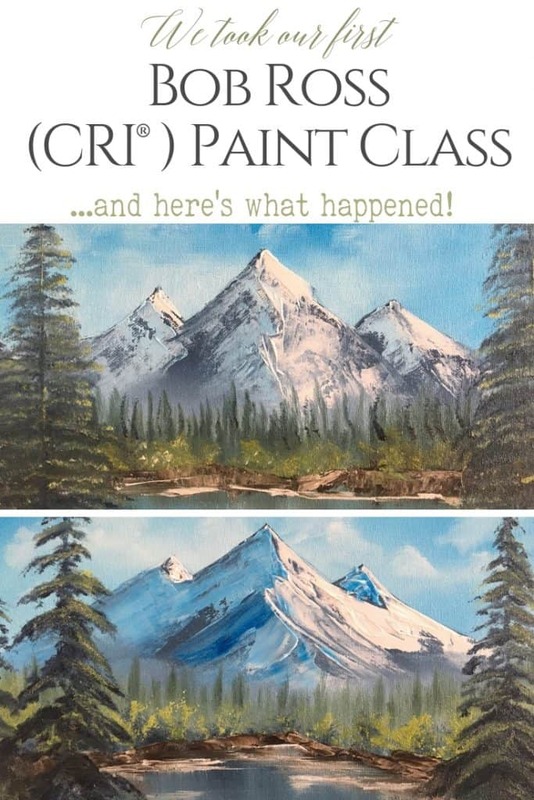 I love Bob Ross and his homey style of instruction. I paint in acrylics so my paintings have a different look than Bob’s and yours, which I have to say impress me a lot. You’re both talented ladies and I hope you continue with the art classes. Thanks Joanne! We have a lot to learn but it was nice to be able to pull off a painting that didn’t look too “beginner”. We both enjoyed it so much!